I learned a powerful lesson about self-belief last week. The note in my training log! 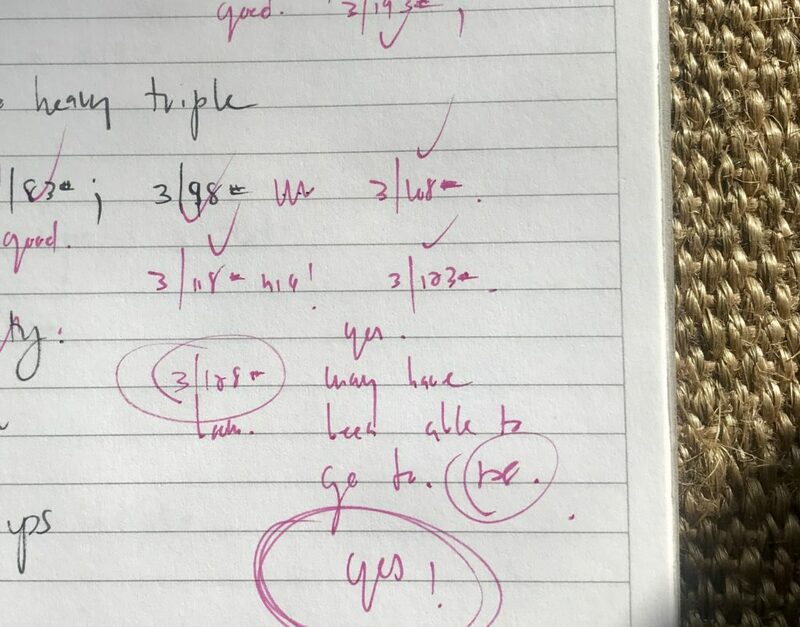 At some point after writing the note and before my two-minute rest interval was up, the word “try” entered my brain. I was considering adding weight and attempting one more set. I thought: “Try, Cara. Just try. Strong core. You can dump the bar if you need to.” I took a breath, focused in, and went for it. And… DONE! My legs felt solid, back strong and just like that, my heavy triple for the day went up by five pounds. Now, I have failed plenty of lifting attempts before. I’ve dumped the bar in front squat and back squat, and God knows how many times my body said, “nope” halfway through the clean. I’ve also completed lifts that I wasn’t 100% sure I could do. So why does this one instance on this particular day stand out so powerfully? I suspect it’s because for a split second after completing my pseudo last set—the one before adding the extra weight—I was done. And not just done but satisfied: happy with the numbers and content with the effort. I had been sick earlier in the week and to be honest, almost called it a day before even starting the squat sets. So of course I’d be happy, of course I’d be feeling good about the work as complete. Regardless of the reasons though, the point is that I walked out of the gym with one message, ingrained in my psyche loud and clear: Give yourself a chance. I take pride in my ability to push my body and if you are an athlete, I bet that you do too. There is a distinction though between working hard and pushing yourself, and going for something that you might not be able to do. The former requires discipline and focus. Calling on both practices, day in and day out, is definitely a feat on its own. The latter adds in an element of uncertainty, which, many times, also means fear. We limit ourselves as a result. We work within the boundaries of our perceived capacity. We do so unknowingly and unconsciously, and not just because of uncertainty or fear. We do so because our beliefs ultimately dictate what we can and can’t do. In the context of rowing, we let past performances dictate our expectations for the future. We determine our goals, rate our performances and gauge how we do in practice relative to the people around us instead of truly looking within. We listen to coaches who may not fully know the edges of our mental and physical ability. We bound ourselves by the stories and “truths” we learned as kids. I was rowing for Undine Barge Club the first time I broke 7:30 on the erg. After the 2k, I remember my coach telling me that he thought I could go around 7:35. My response: THANK GOD you didn’t tell me that beforehand! Who knows if and how his expectation would have actually affected my piece. But I can guarantee I was glad that I didn’t have his number as the target in my head. After Head of the Schuylkill this year, one of my friends made a comment about being happy with her race because she finished closer to one of her competitors than usual. It made me think about how easy it is to just accept your ranking within your peer group versus fighting to win regardless of who’s next to you, in front of you or behind. And how often this “acceptance” may actually keep you from accessing your true speed. Think of it in the context of the erg (it’s easier to imagine with the numbers). Let’s say you’re doing 10-minute pieces. You normally average 2:00/500m. The girl next to you usually goes 1:58/500m. Plus, her 2k is faster and she beat you on the water last year. You’ve been working hard, you’re feeling good and you see your split go down: 1:59… 1:58… now you’re cruising at 1:57. You look over and your teammate is at her normal 1:58/500m. You see her split and then back off just a little because you’ve accepted her as faster, and now doubt and fear about your own ability start to enter your mind. Gang, the mind knows NO limits! Think about it. The mind can be your worst nightmare. Or, when you open it up to POSSIBILITY, it can be your best friend. Do you remember the saying: Shoot for the moon, even if you miss, you’ll land among the stars? That’s what I thought of when I started making notes for this piece. Because here’s the deal: It’s not easy to push past limits. It takes courage. It takes courage to take chances and tap into new territory, and courage to really go for things that you’re not fully sure you can do. But the alternative just leaves you wondering. If we choose to stay safe and protect ourselves, if we choose to abide by old storylines or let others define who we are and what we can do, then we’ll never fully realize the greatness inside. So… Shoot for the moon. Because even if you miss, you’ll land among the stars. Happy training, my friends. Work hard. Work smart. Take chances. Be brave. Lessons and words of wisdom for all athletes! Powerful lessons for life we can all live by!